China threatens "grave damages" from Obama-Dalai Lama meeting. But does it really back up its threats? Does China Back Up Its Dalai Lama Threats? The world’s most awkward guest. The White House clearly anticipated this reaction, announcing the meeting only last night. 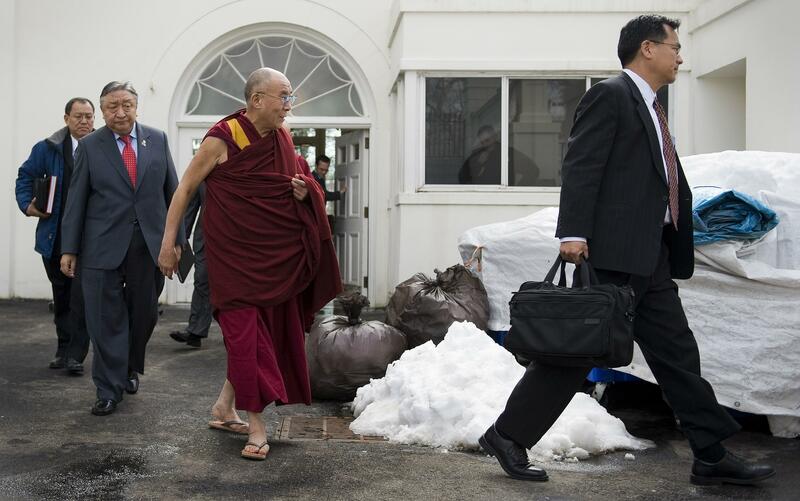 Hopefully this year, they can avoid the unfortunate optics of 2010 (above), when the Tibetan spiritual leader was photographed coming out of a back entrance of the White House past piles of trash. China issues a nearly identical statement of outrage every time a foreign head of state meets with the Dalai Lama, but does it ever follow through on its claims that bilateral relations will be seriously damaged? According to one analysis, it does, but not for very long. It’s worth noting that the analysis looked only at the Hu Jintao years. It’s not yet clear whether Xi Jinping’s government will take these gestures quite as seriously. It also seems unlikely that the U.S.-China trade relationship—one of the world’s largest—will be affected to the same extent. As Lily Kuo points out, previous meetings between the Dalai Lama and U.S. leaders don’t seem to have had much of an impact. But the overall takeaway of the analysis is that China does indeed take these meetings very seriously, but isn’t willing to let them get in the way of doing business for very long.